This fantastic San Francisco Hop-On, Hop-Off Tour covers the very best of the city and allows you to build your own itinerary to explore all it has to offer. Sit back and enjoy fantastic views from the top deck of an open-top bus. When you get to a stop that interests you, hop-off and explore. More than 30 Stops are designed to give access to the most popular locations. 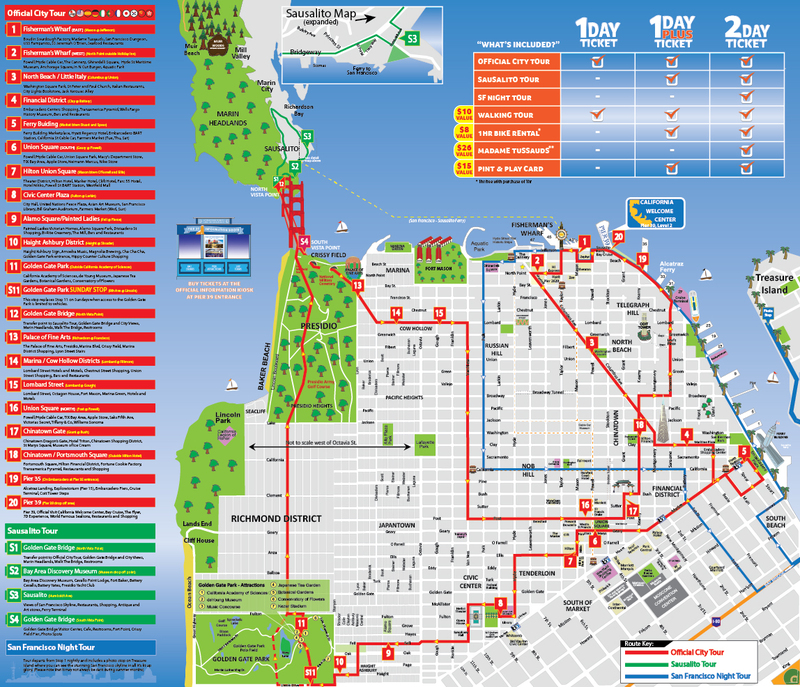 The 1 Day ticket covers 2 routes: The Official City Tour Route and the Sausalito Route. The Official City tour loop takes you to all main sights of San Francisco, including the Golden Gate Park and North Vista Point. The Sausalito loop takes you over the bridge for the breathtaking, "camera-at-the-ready" view, plus a chance to explore charming Sausalito. Upgrade to the 2 day ticket and take the Night tour to get spectacular views of the Bay from Treasure island and with entry to Madame Tussauds. Plus - Included with this hop-on, hop-off ticket is FREE 1 Hour Bike Rental (*with 1 hour purchase) and 1 FREE walking tour of Chinatown! Your ticket is valid for 1 or 2 days from first use. Official City Tour: From 9:00am to 5:00pm every 30 minutes. Sausalito Loop: 9:30am to 4:00pm every 30 minutes. Since this is an outdoor activity, schedules might change sometimes, check the frequency and bus operating hours on the day of your tour just to be safe. You may board the bus from any of the stops. Night Tour: Departs from Fishermans Wharf - Visitor Information Center. Hop on the bus at any of the stops to start the tour. On this Hop-On Hop-Off tour, you have the freedom to plan your own sightseeing itinerary. With more than 30 stops covering all of San Francisco’s main attractions such as Fisherman’s Wharf, Civic Center, Union Square, Chinatown, Golden Gate Loop, and Pacific Heights, this tour provides the perfect introduction to San Francisco. Listen to multilingual commentary available in 7 languages along with a live guide. 1 day which offers access to 2 routes: Official City Tour and Sausalito Loop. Sausalito Tour: Start this from North Vista Point to witness the best views of the Golden Gate Bridge and then head into the charming town of Sausalito. On the way back, you will drive across the bridge again to the South Vista point. You may hop off the bus at any of the stops to end the tour. Fisherman's wharf is the stop for you Madame Tussauds experience with your favourite stars. The Night Tour : Starts from the Fishermans Wharf. The complete tour ends after approximately 1 hour 30 minutes which takes you through the most stunning neighbourhoods of the city including Financial District, Bay Bridge, Treasure Island and lots more. On your way back you will see Union Square, Chinatown and so on. The route of the hop-on, hop-off tour is subject to change. Your voucher will be valid for 3 months from the date chosen at the time of booking. Wheelchairs can be collapsed down and stored on the bus however the bus do not have ramps, passengers would need to walk up 1 step. Cruise passenger information: Cruise passenger information: Make a right on Embarcadero St. after exiting Pier 27. Walk about 2 blocks to Pier 35 which is Stop no.19 on the Official city tour. This bus will bring you Stop no.1 at Jefferson and Mason, from where you can walk a distance of a block to the Skyline sightseeing office. The online purchase experience worked well.